In Crime Solitaire, the Mayor of Topley and the Chief of Police have vowed to save the force from shame by enforcing ancient and little-known laws. As a rookie to the force in modern-day Topley, it's your job to hunt down a new breed of felon and take them out of society.Earn promotions and use power-ups as you explore the city and turn the police department around! Crime Solitaire is rated 3.9 out of 5 by 21. Rated 5 out of 5 by Eveoflove from Game is great despite disappointting "demo" Review based on completed game in “Normal” mode. Let’s get something out of the way right from the start: this is a Solitaire game, not a Crime Solving game: the crime solving is the game’s context, just like other games use other settings; you don’t need to know how to play golf to play Fairway Solitaire. The game has so many features that I strongly advise you to take 5-10 minutes to read BFG’s “blog walkthrough” BEFORE even downloading the demo/game, especially sections 5 to 7; it is a fantastic explanation of the game’s features/screens, better than the inline help of the game... it is NOT a solution to the “levels”. 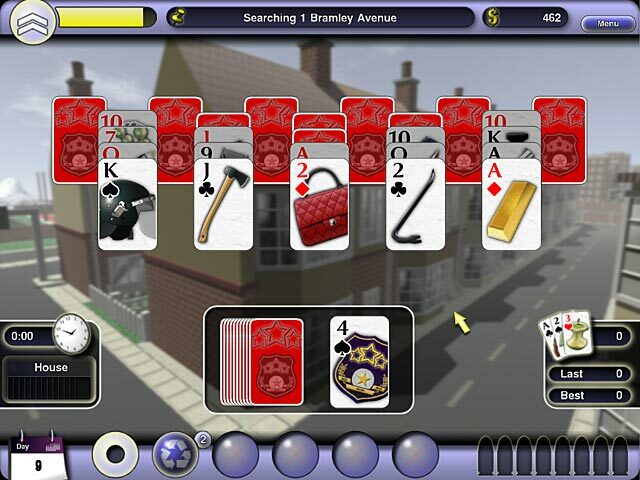 CRIME SOLITAIRE is of the 1-up/down type with the usual obstacle of having certain cards “blocked” until you find the required “key” (which, by the way, is never visible). There is NO time limit in any portion of the game. 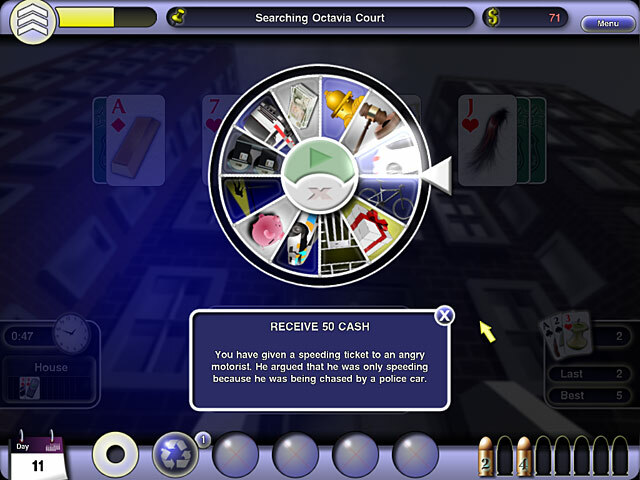 The crime solving content is possibly best summarized as: - The objective is for you to solve 52 cases - You follow multiple leads (“game boards”) for each case; the lead/location is simply used as the wallpaper for that scene... there’s nothing bloody or gory about them - Each case has 2 to 6 suspects - Each suspect will be assigned 1 clue (e.g. “the suspect likes to take photographs”) - You need to obtain evidence to eliminate each suspect (e.g. “the suspect does not own a camera”) - You need to earn enough money to buy an arrest warrant ($400 to $5000) and only have 1 suspect left to solve the case Unfortunately, the trial doesn’t equip you with all the “tools” because you’ll earn them as you progress in rank and that won’t be completed within 60 minutes of play; that’s a shame because you don’t get the full “impression”. The walkthrough document describes them if you're curious. For those worried about this being possibly a short game, each “lead” counts as 1 day in your career. The lead might provide more leads (boards), clues, evidence; if you don’t clear all cards of the board, you can skip to the next lead or replay the same board (but the cards will be different) to clear all cards. It took me a total of 491 leads to solve the 52 crimes; each level would generally take me 2 to 5 attempts to clear, so I’ve played MORE than 1000 boards to finish the game, and I enjoyed every minute of it. Lastly, I played the whole game using Windows 10 without any problem. Rated 5 out of 5 by knoxvegas56 from Relaxing and funny Solitaire games generally bore me but not this one. As a member of a slightly inept police department, your job is to collect clues to determine the perpetrator of crimes like sleeping on a refrigerator, walking a goose, singing in public, etc. The Wheel of Misfortune pops up now and then and you may be rewarded with extra cards, money to go toward the warrant fee for the crime, bribe money (seen as an innocent gesture of good will), etc. or you may lose cards or money on the wheel. There is no time limit on the levels so it is very relaxing. Rated 5 out of 5 by mccurdynk from Relaxing Game, Enjoyable to Play This game is very relaxing (to me). One of those I play often when I am tired of more challenging ones. It is on the level of a "no-brainer" and sometimes I want that. To sit on an off-day and just play a game that challenges some times and quick play-through at others; this is one of those games. One of the best solitaire games offered with a little twist that you have to choose who the perpetrator of a made-up crime is. Rated 4 out of 5 by Mazeo from A good Solitaire Game What I liked about this game is that it seems to be designed to be "winnable." It seemed to me that if the player took the right options, then the cards would "fall well." It might take a couple of tries to work out the correct strategy .... but I found that there was a method involved in playing the game and it wasn't completely based on random luck. (you would need the "bullets" though to solve the final crimes). I found the "crimes" pretty amusing. It's pure solitaire only, so don't expect anything else. 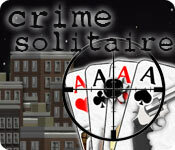 Rated 4 out of 5 by mrm2006 from Solitaire and finding criminals all in one game. There's a lot going on in this unique game of solitaire. 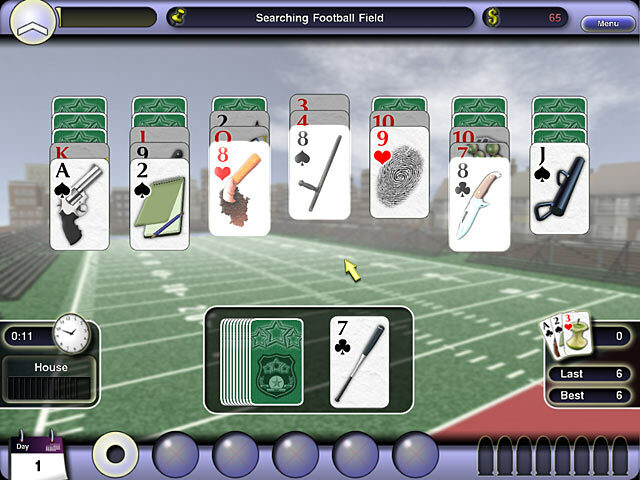 You investigate locations by playing classic solitaire. The more "perfect" games you get the higher ranking you will become (i.e., patrolman, sergeant, etc.). You find clues (somehow) and receive awards and messages that inform you if you have enough clues to "pin" a suspect. Then, you go back to the Station House, log onto your computer, use your clues (I only ever saw one) and get your man (so to speak). There's also a "wheel of misfortune" which you can spin to win or lose cash - but it's very small and repetitive. I really thought this game would interest me what with the various locations, etc. Maybe if they would have thrown an HOG or something in there as well, but I found myself looking forward to the end of the free, hour-long demo. What I thought would be a buy for me ended up being a boring, repetitive game. I do encourage everyone to give it a try though. Happy Gaming! Rated 4 out of 5 by chevyqueen from Almost as much fun as Fairway Collectors Edition Be sure to read the "newspaper". This game is so funny! I have been playing pc games for years. I also have been playing cards since I was hold enough to hold them in my hands. Remember "Go Fish" and "Old Maid"? I have been searching for a good solitaire game for awhile. I haven't finished this game yet. I was just too excited to wait until I finish it. I highly recommend this game! Rated 4 out of 5 by ailingmom from way too long This game is very enjoyable but after awhile it's a little boring. Sure would like to know if this ever ends. Been playing for days. Does it end? Rated 4 out of 5 by BeInformed from This is a step up from Fairway and Fairway Solitaire This game adds more challenge then just beating chance and luck. Quick movements, The crime solving part is really a secondary aspect that is no challenge, however just try to get all the trophy's. So take this Solitaire game on, I am just playing it again. Still just a bit maddening like it was when it first arrived.